These are just a few handy tips when you are dealing with a sudden release of oil from your tank. First of all, is it safe? If it’s not, i.e. 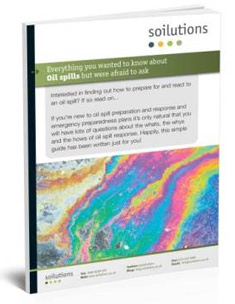 big pools of oil, or vapours making you dizzy or ill, remove yourself and call an emergency spill responder. If it is safe, stop the leak! If it’s a problem in the feed line, shut off the valve. If it’s springing from a crack, you can use a bar of household soap to stop up a crack. Grate the soap against the crack until it is sealed up- this is only a temporary fix! If this is impossible, try to catch the oil in containers to prevent it being lost to ground. Once the leak is stopped, you need to prevent it from reaching any drains or nearby bodies of water, if you don’t happen to have a spill kit with drain mats and socks handy, clay or sand is very effective at absorbing oil. Cat litter also makes a great absorbent, particularly if odours are an issue as it will help to neutralise them. Never attempt to wash the oil away with detergents; this can end up spreading the oil over a much wider area. Now you’ve limited the damage, but there is still some oil contaminated soil to deal with and a split tank/hose, time to call in the clean-up crew!